ANIMALS - SignOn - Connect. Practice. Retain. * Talk about the animals you have in your home (Pets). Describe their color, size, description, fingerspell their names and tell their age. How many pets do you have? What is their favorite thing to do? Do they have a favorite toy or treat? Are they your pet or are they the family pet? Did you adopt your pet or did you get it from the pet store? * Play a game of “Spot the Animal” from various places – describe or act out an animal’s particular features without giving away their Sign (Giraffe will be hard). * Tell a story about an animal experience you’ve had – watching a baby bird hatch, a horse carriage ride, dogs playing at the dog park, etc. Don’t leave the details out. – What do you feed your pet? – What tricks does your pet know? – What is your favorite animal? – What animal is cute? Ugly? – What animal are you afraid of? – Have you ever been to a farm/zoo? – If you could have any animal as a pet, what would it be? * Have fingerspelling receptive practice with each other. 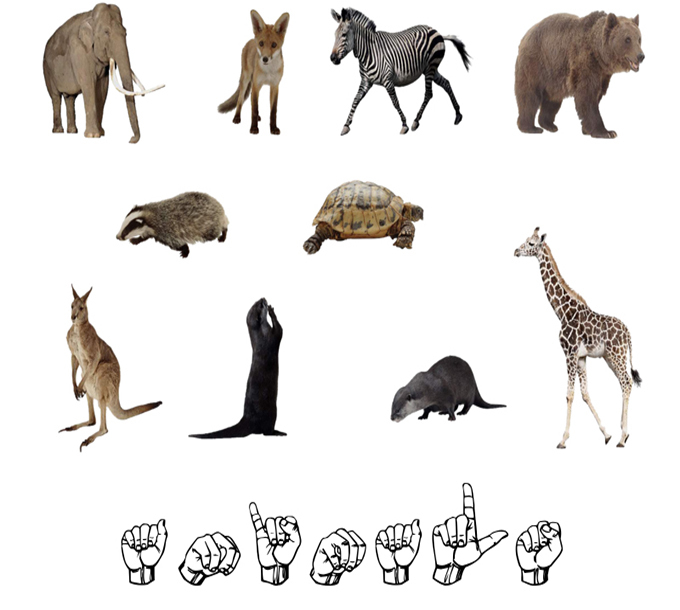 Have one person fingerspell an animal and the other give the sign for the animal.